and the up picture is so hilarious! p.s. had to ask--where'd you get all of the pieces from your lovely outfit?! Just lovely! And that picture is hilarious, I love that movie! The outfit is really cute. 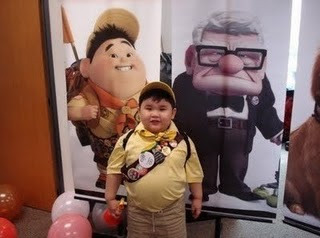 I honestly have not seen the Up movie yet but the picture is seriously funny! that is one gorgeous outfit! Your tights are great! The whole outfit is adorable! If I could live on a librarian's salary it would be my dream job! That lil boy is too funny! your tights make the outfit, love em!and that skirt is pretty awesome as well. Super cute! I love the bow belt! cute outfit!! i'm so excited for the swap! and that picture is killing me! it's just about the cutest thing i've seen all day! I want your bow belt soooooooo much!!!!! you are SO adorable. I LOVE your outfit! so so so cute! and about that cute little boy! Your outfit looks absolutely adorable! Oh that little guy is soooo adorable! you have the cutest outfits!...EVER! love your tights and skirt. great find! who would have thought the swap would be so Crazy!!! you're the cutest thing in a shiny bow belt EVER. i love the color combo, it's gorgeous. yay for partners! So, I am in love with that skirt! Way awesome. Not just any librarian could pull off this awesome look! I think you make a cute librarian!! !..outfit is adorable!! and i can't believe you have 200 craft swap people!! that's awesome!! that outfit is great! i love the color combination. And the UP picture is sooo adorable! also, holy lol to the last photo, hehe! I love your outfit. You know what? Tomorrow I will go to the post office to get my little owlette from... Skunkboy Creatures!!! UPER CUTE outfit! You look lovely! And the little boy's pic... hillarious! By the way... here in Greece we have an old journalist named Zahos Hatzifotiou who looks IDENTICAL to the old man from the movie! Here, take a look! you are so cute and tiny and i love the outfit! prettiest 'librarian' outfit i've ever seen! and oh my, that boy is too cute! I really love your outfit. That belt is so pretty. And that picture of that kid and Up pretty much made my day!! looking cute as a button Katie!